The history of Christian Clowning dates back to the medieval days when royalty hired jesters to entertain them. The movement was revived in the 1960’s by a Lutheran pastor in Iowa. 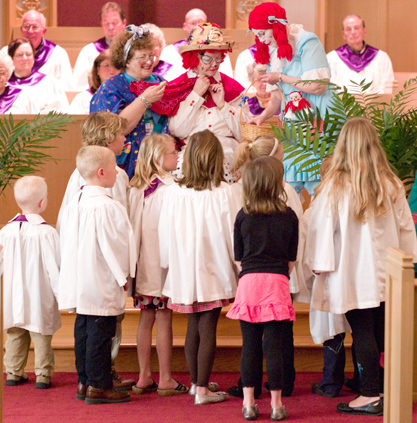 Since then the clown ministry has grown to serve many Christian denominations throughout the world. 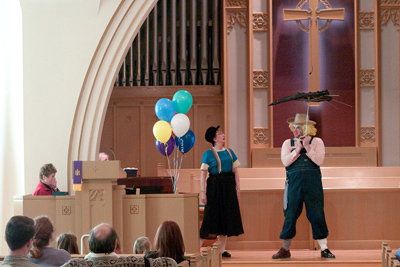 Christian Clowns differ from the typical clown in three important ways since a Christian Clown is not a fool to the world. First, Christian Clowns are always positive. They strive to uplift a person, never to humiliate, embarrass, or put them down. Secondly, they do not speak. Their silence follows Christ’s teaching to show love rather than speak it. Third, they do not wear gloves since human contact is so vital. The clown colors symbolize the following: white makeup represents the birth of a new self-becoming a new creation; red is the blood of Christ (the upturned mouth symbolizes Christ’s hands upon the cross): blue is loyalty to all Christ commands; purple, Christ’s loyalty, green, everlasting life; and yellow, the light of the world. Most Christian Clowns wear a cross or three tears to represent the Trinity. Our troupe now wears a heart in honor and memory of our fallen comrades, Luvee and Huggins. We are a service group and perform for church functions and services, town parades and special events, and charity activities. We are here to share God’s love in a unique way.